Well, I do not usually say negative things about our adoptive country, however, bear with me just this once. Do not, I said do not, open a bank account here! I opened an account to send a monthly payment to our landlord in Florence. For the last two and a half years, no problems. Then all the staff with any authority at the bank, went on holiday at the same time, and I found I could make a deposit on the due date, but not make a transfer. So just three days later, I return to the bank so authorise the transfer and the account was twenty euros short! Nobody could explain why, so I said in Italian of course, “Has the government grabbed it or has the bank just stolen it?” Everyone there was hugely apologetic, however, I got nowhere. So have arranged a nine-thirty appointment with my personal banker who is back on Monday. The only saving grace is that my Italian landlord was not in the least bit surprised…..
Brighter things. Last Sunday we had a fun half-birthday with our daughter, son-in-law and grandchildren. It was a half-birthday for our grandson’s fourteenth, because he is off to start his new school in England and will be away on the actual day. We will celebrate the other half-birthday at half-term! So, the guys went to play a round of golf and we girlies took the granddaughter for a horse riding lesson. Whilst we waited for the our lovely nine and a half-year old, we repaired to the gardens of the very beautiful Villa Pignano somewhere between Siena and Volterra, and coffee in the courtyard. Then we returned to our daughter’s house for lunch. The afternoon was great fun as we played cricket in the garden and would you believe it, I bowled and got a wicket! 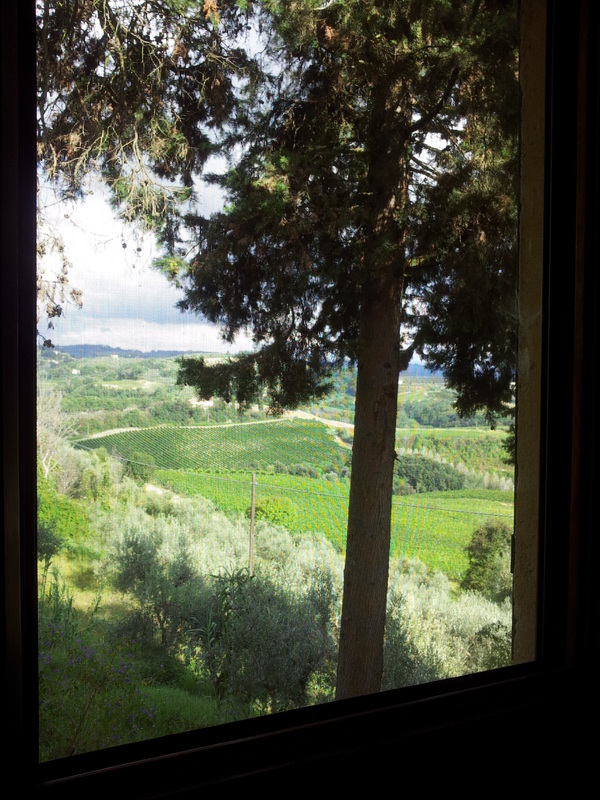 Green August countryside through our guest bedroom window. Meanwhile, back at our villa, it is was Friday and aperitivo time, and I relaxed with a deep sigh after a hard, but satisfying week at the key-board. “Can you see anything different?” my man asked in his usual casual manner. “Mmm, the view seems to have opened up a bit I think” “Yep, you’re right; I was trying to get to the last of the plums, but the ladder wasn’t long enough, so I chopped the tree down…. “What!” I sprung to my feet, well sort of, and rushed to the railing above the orchard. There in the middle was the sad-looking tree, not exactly chopped down, but severely pruned. (do you get it?) “Isn’t it a bit early to prune a tree?” I asked. “Depends whether you wanted the plums and I wanted another crumble…” He said authoritatively. 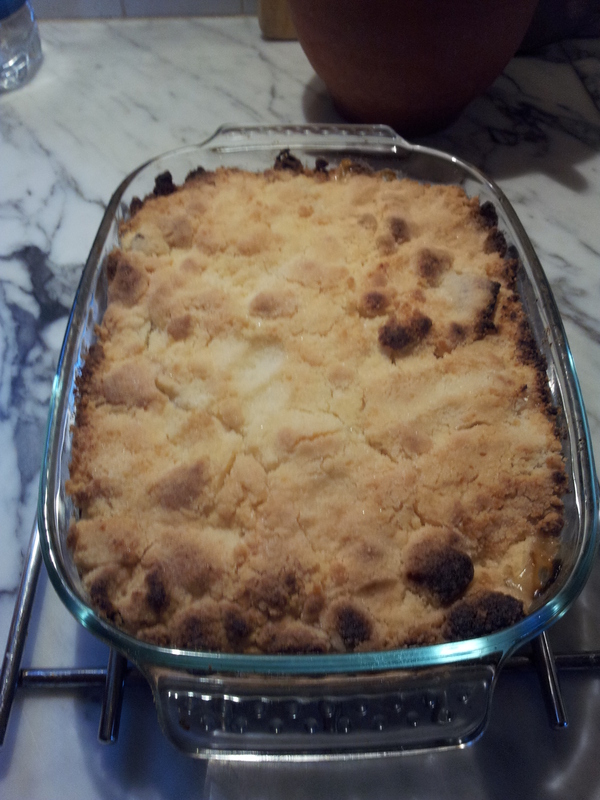 I sighed, I had to make the crumble. Looking across the valleys we realise just how incredibly green everything is for August. We gazed down over the valley below. This time of year the countryside should be burnt to a crisp and only the vines, olive trees and evergreens retaining their colour. Very strange weather indeed. “It’s a beautiful day for October,” my man groans. Previously, back at C’era Una Volta for a weekday lunch, an Englishman rushed in asking for directions to a villa, where they are having a big wedding. “It’s big with a tower, you must know it!” We refrained from saying, ‘there are hundreds in this area’ and looked at his computer generated paper instructions. I am about to draw any easier map and my man grabs the details. He looks at them and announces, “I’m pretty certain that’s Paola’s brother’s place, you know, on the main road, it has a tower.” The tourist turns to my man, obviously he thought him more likely to be helpful. So, he is given verbal directions, which were awful and sent on his way. 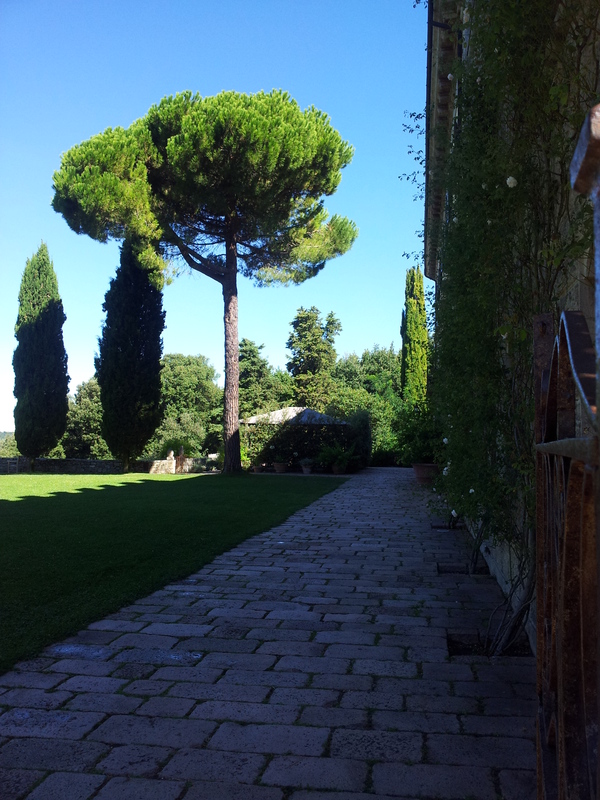 “Those directions were terrible,” I said, “And are you sure it was the right villa?” “No, but it might be the right place.” my man grins, “Anyway, when giving directions you just need to sound confident, because they will have their doubts anyway….” I reached for the bottle of Chianti and topped up my glass. Meanwhile, out there in the land of the rich, Silvio Berlusconi doesn’t seem to be newsworthy! I’ve checked his fan club, yes he has one, googled the various news channels; nothing! Mind you, everyone is still on holiday here and that probably also applies to our Peter Pan of Politics. Perhaps no news is good news, who for, who knows? Well, so much for that. I’ve had a really good week with ‘The Bolivian Connection’ and have written two more chapters. There are some dodgy repercussions about to erupt after the reading of my heroine’s father’s will….ooer! Watch this space.